What’s better than pizza? 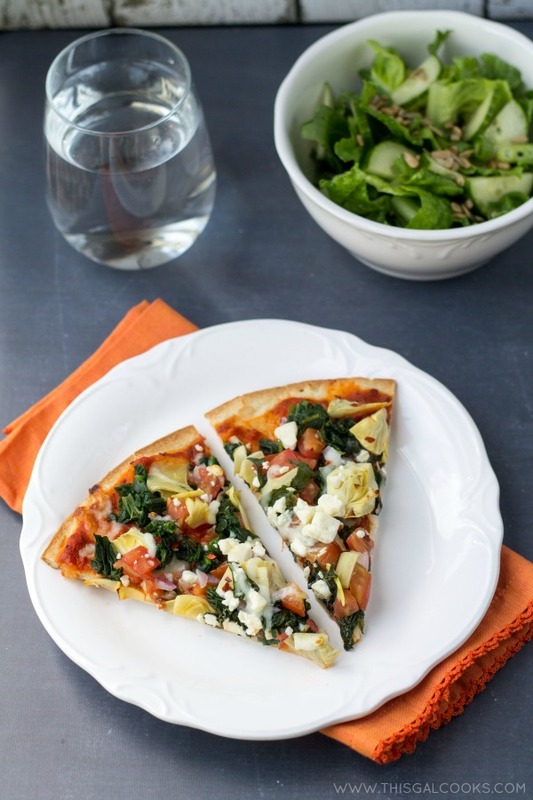 This Tomato, Spinach and Artichoke Pizza is both healthy, tasty and easy to make! Ken loves pizza. Seriously, he could probably eat pizza most days out of the week. When I asked him what he wanted for dinner the other night, naturally, his response was “pizza.” Pizza. Yikes! I say “yikes” because I am trying to stay away from dairy. Pizza and cheese pretty much go together. And of course, cheese is dairy. I thought I would make this pizza without cheese but in the end, I decided to use a small amount of cheese on it. Ultimately, including cheese on the pizza resulted in me taking a lactaid pill. But it was oh so worth it. 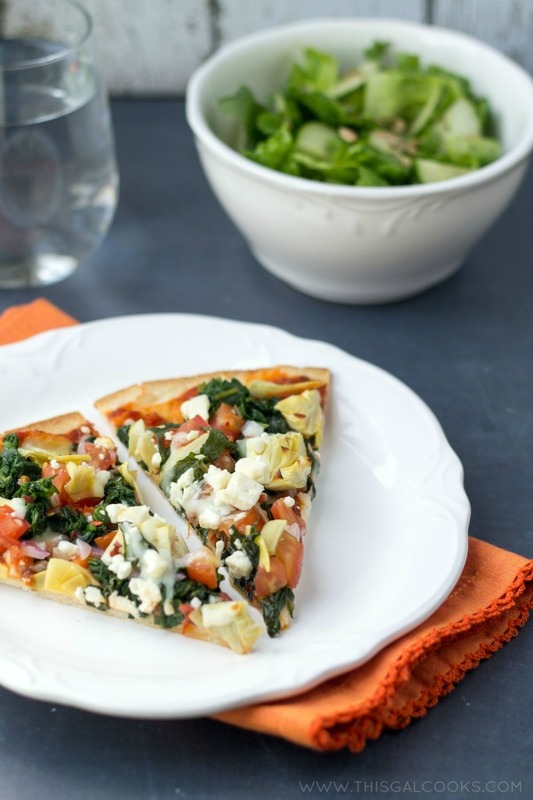 The feta cheese paired so well with the veggies on this pizza. Tomato, spinach, onions, basil, artichokes. That’s a palate pleasing combination right there. What are your favorite toppings for a pizza? We have a little independent Italian restaurant by our house called Giuseppe’s. Their pizza is absolutely wonderful. I’d have to say that it’s in my top 10 list of favorite pizzas. Another pizza joint on my top 10 list is Pusateri’s Chicago Pizza. Want to talk about awesome pizza? Let’s talk about that place. If you are ever in Stuart, FL, you MUST go there! Anyways, let’s get on to that recipe. I know you’re starving for it. 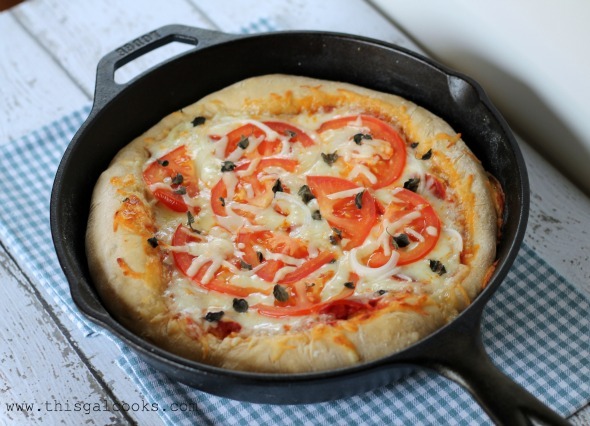 Spread the sauce over the pizza crust and then sprinkle with ¼ C of the mozzarella cheese. Place the spinach, basil, tomato, onion and artichokes on the pizza. Drizzle with the olive oil and then sprinkle with the crushed red pepper, if desired. Sprinkle with feta cheese and the remaining mozzarella cheese. Bake at 425 for 8-10 minutes or until the mozzarella cheese is melted. Yum! Tim loves burgers and I love pizza..well he loves pizza too but not as much as I. I am very particular when it comes to my pizza crusts…it has to be crispy on the outside, pillowy on the inside with a nice chew. Well, that’s ideal but I’ll take any pizza crusts I can get depending on the toppings and this one sounds marvelous and healthy! Can’t wait to make this soon. Thank you so much, Min! I normally prefer thin crusts to thick crusts. Not that the thick crusts taste bad…I just think its too much crust! Julie I can’t get enough spinach these days, yum! I am in the same boat as you! I’ve been putting it on sandwiches, in salads, pizza! It’s so good! Oh my gosh–this looks absolutely divine! 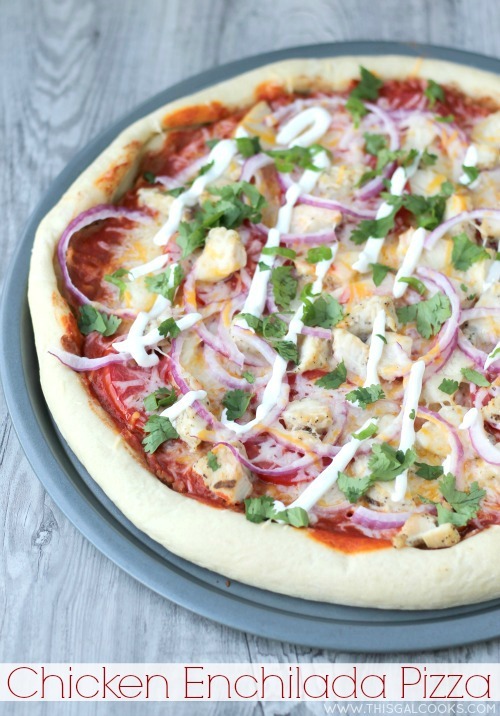 I made a pizza similar to this once but it didn’t have nearly as much of the delicious feta and artichokes.. I think I know what we’re having for supper tonight! :D Thanks for sharing! Hi Annie! You’re welcome! This was so good and so simple to make! It will definitely be made again! Oh man Julie this pizza looks fantastic!! Spinach and artichoke is such a classic combination! Can’t go wrong with this pizza! It looks great! I love the feta and artichoke additions. This pizza is right up my ally!!! Yay! It really is a great little pizza! Ha, on Friday (we had this pizza on Tuesday) I asked my boyfriend what he wanted for dinner and he wanted pizza, AGAIN! So we had pizza again. He also love burgers. I guess men love their pizza and burgers! I love the veggie toppings as well. I do enjoy pepperoni and the sliced meatballs as well. I think the sliced meatballs are my favorite! I’m a massive artichoke fan! Yum this looks good! I’m loving your fresh pizza. Perfect for Summer. Thanks for sharing your creation. You’re welcome, Lea Ann! Thank you so much for stopping by! It is so good, Laura! I hope you enjoy it! 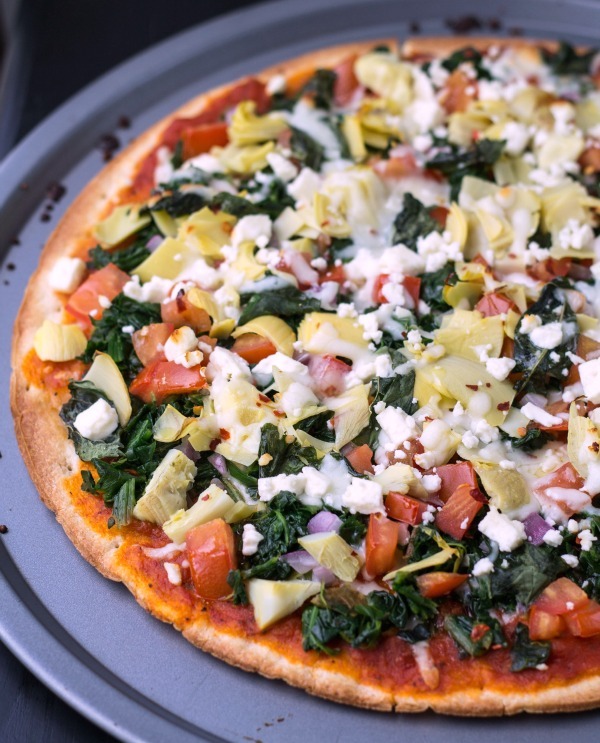 Spinach, artichoke and tomatoes… I don’t believe there is any better combination! You have succeeded in making me very hungry!